While most of the works of this world are doomed to dust, there are things that last, mostly truths that remain solid beyond notions of yesterday, today and tomorrow. These sorts of non-ephemeral things tend to shift their form, choosing whatever representation might work best at reaching folks, and thus maintaining their elusive nature through transmogrification. Still, we recognize an enduring an idea even glimpsed through veils, and there are SO many of these enduring, big ideas inside the work of Nathan Moore, and never more so than Dear Puppeteer (released February 1), which serves as a crystallized summation of what’s already special about Moore and extends the possibilities in a quietly stunning way. To Whom It May Concern, yes, I am complaining. 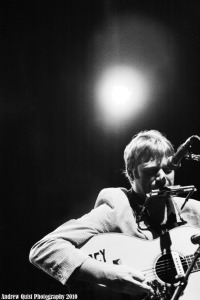 Moore has long carried shiver-inducing echoes of great forebears like Woody Guthrie, Will Rogers and Hank Williams but Dear Puppeteer offers an intensity of feeling and non-showy seriousness about his craft that jives with contemporary standouts like Kris Kristofferson, Loudon Wainwright III and Elliott Smith. Taken together, this album seems to indicate no real bounds for his songwriting acumen, touching on modern rock (Safe To Say), nouveau folk (A Little Crazy), gritty country (I’m The Same), skeptic’s gospel (Can’t Fly To Heaven), haunted blues (The Garden) and more. I wish I was the happy ending, and not just the plot twisting about. Nathan has collaborated with some real heavyweights and comers (notably, The Slip and Big Light) but co-producer Bryan Elijah Smith may be the best creative foil he’s ever had. The instrumentation and mix are just right, and no hand is played too hard or obviously, the tunes flowing as gracefully as a creek over stones, breaking on the shore with a sigh and then moving ever-onward. A traveler’s logic infuses Moore’s catalog, which nods fondly to bounders and rounders, scamps and grifters, the lost and the longing. His eye captures all the right details – the Acme crates piled in the corner, the one trick pony in a one horse town – and then dishes them out with a short story author’s judicious care. In this way, Moore breathes life into the world, even bounding into cartoon form or the splintery confines of a wooden boy to shift our perspective a few degrees, revealing the world in a Dixie cup we might otherwise have crumbled and tossed away. I’m not getting younger, never found that fountain. His music often feels like a gift, a benediction from a kind creator, a missive from a prophet only partially understood in his time, but I’m not sure he’s ever wrapped up a more beautiful or touching present than Dear Puppeteer. And the bow on this one is closer I’m Good Company, a sing-along familiar to Moore’s audiences, that shakes off the dread of growing older, drawing the universe’s arm around our shoulder and making one smile at everyone about. In step with the rest of the album’s nigh-perfect construction and sequencing, the version included is a live take with the crowd serving as Moore’s imperfect but sincere choir. It is a continual annoyance to me that Moore isn’t a household name on the folkie circuit and a rising star amongst smarter rock fans looking for something new after they’ve exhausted their Wilco and Bright Eyes albums. Moore has created what might be the perfect handshake for both these demographics with Dear Puppeteer. Hopefully his reach and strong grip here will find the larger audience he’s richly deserved for years. You’d have to be a pretty brilliant writer to even half describe the grace that you’ve displayed/ And you’d have to be a pretty stubborn fighter to tackle all the nonsense that comes our way. Dennis, you nailed it again…I’m ready for the rock novel! i’ll be first in line to get it signed. and bravo to nathan moore to keep the folks music rollin along the dusty road. I’m gonna spread the new album like Gospel. Big ups to SW Virginia!